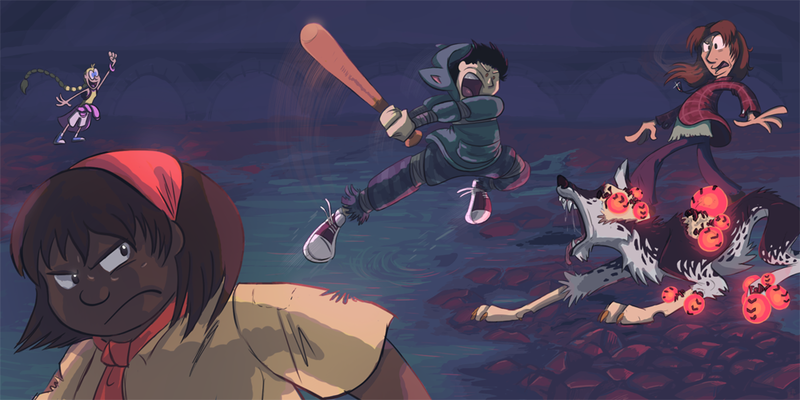 Four survivors of the apocalypse take on a dog infested with bioluminescent parasites. We've all been there, haven't we? This is a profile for a silly little monster I made up. A poster of this was shown at the Altered Esthetics gallery in Minneapolis, MN. Someone apparently bought it, too! Yay! 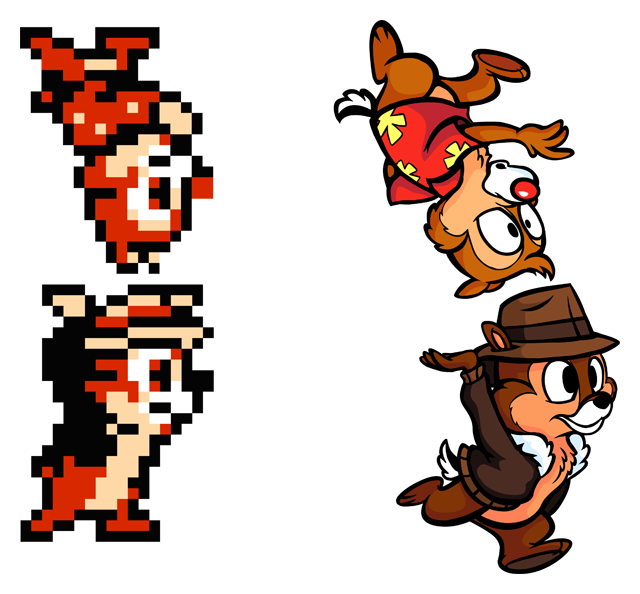 An HD reimagining of the Chip and Dale: Rescue Rangers NES sprites, drawn for an issue of NF Magazine. The issue featured DuckTales: Remastered and talked about other old Disney games made by Capcom. Header image I made for NF Magazine for their article on 3DS games that were ported to the Wii U. A profile for another silly monster I made up. 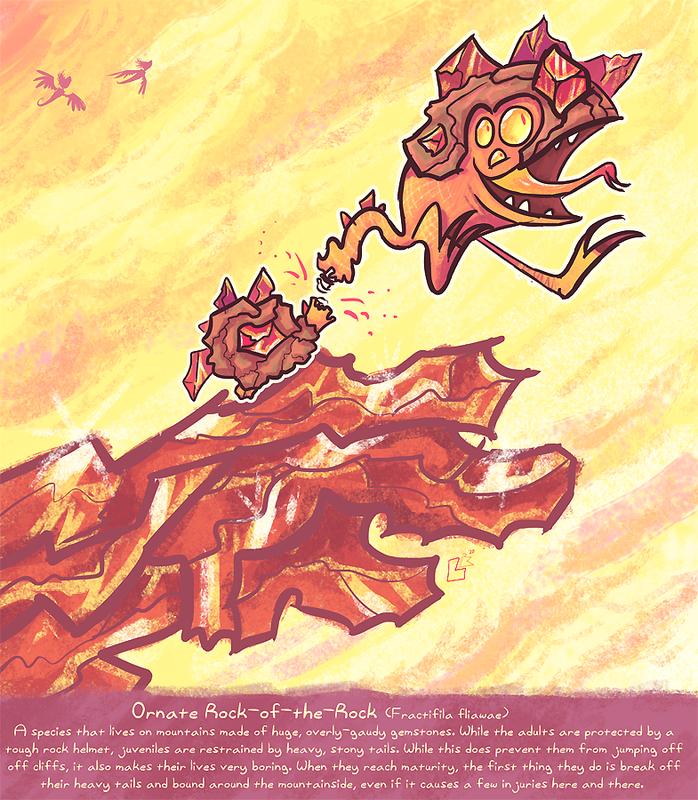 A poster of this was shown during the Altered Esthetics gallery's rock-themed fundraiser. 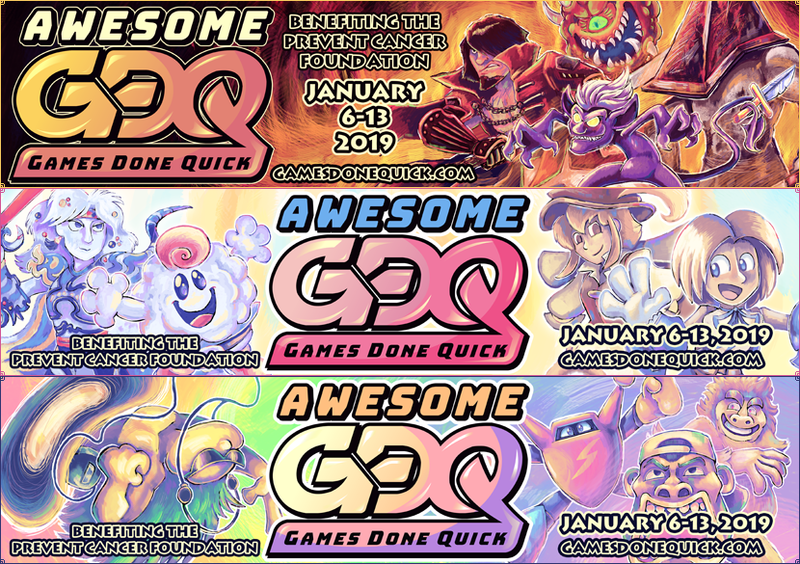 Three of the banners made to promote Awesome Games Done Quick 2019. They were used for social media purposes and printed versions were given away as prizes. 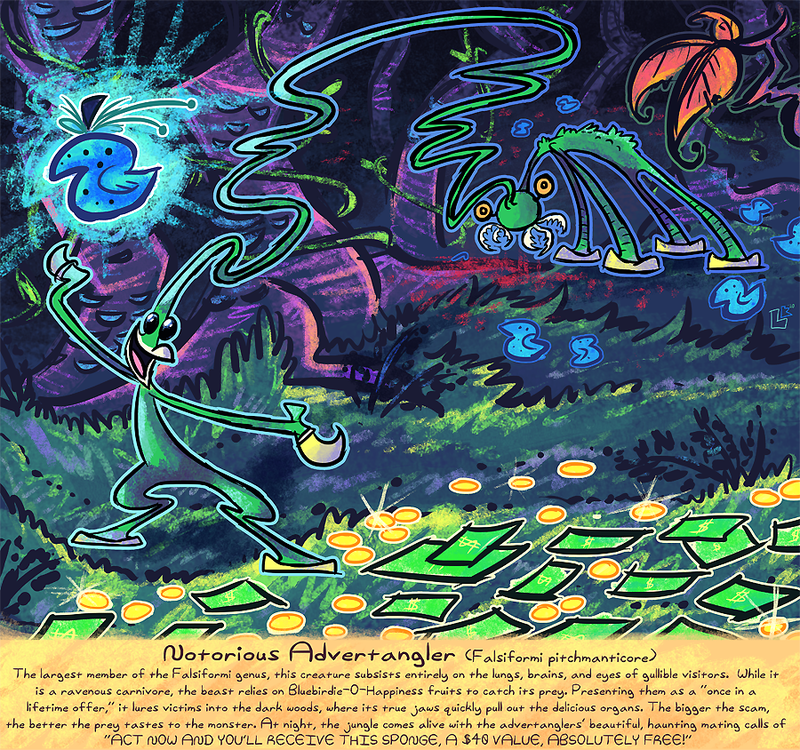 Each one features characters from the different games that were run at the event. The logo was designed by Jon Kay. Pixel art banners made for Awesome Games Done Quick 2018. They were used in promotional material and printed out as physical banners to be given away as prizes. I created pixel versions of the logo, which was designed by Jon Kay. 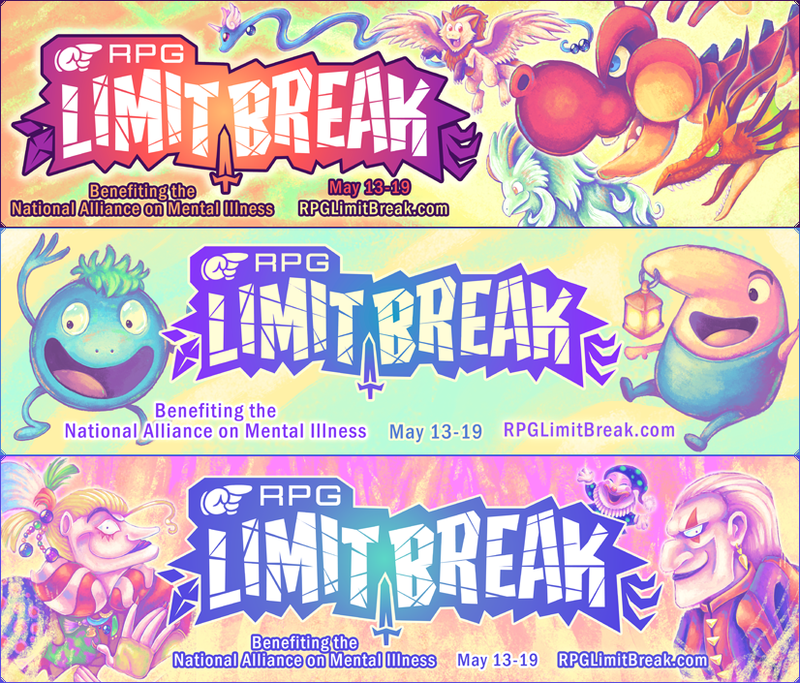 Banners for RPG Limit Break, an RPG speedrunning marathon that benefits the National Alliance on Mental Illness. Limit Break is a very calm, laid-back marathon, so I like using soft colors for their banners. The logo was designed by Kari Fry. 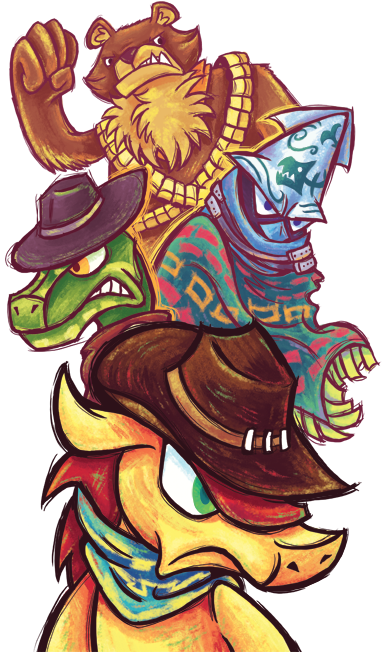 Artwork of the cast of Dillon's Rolling Western: The Last Ranger , made for an article in NF Magazine. Rest 0, a comic that appears in NF Magazine. It's a corny "sitcom" starring the wacky mascot and final boss of a non-existent video game. 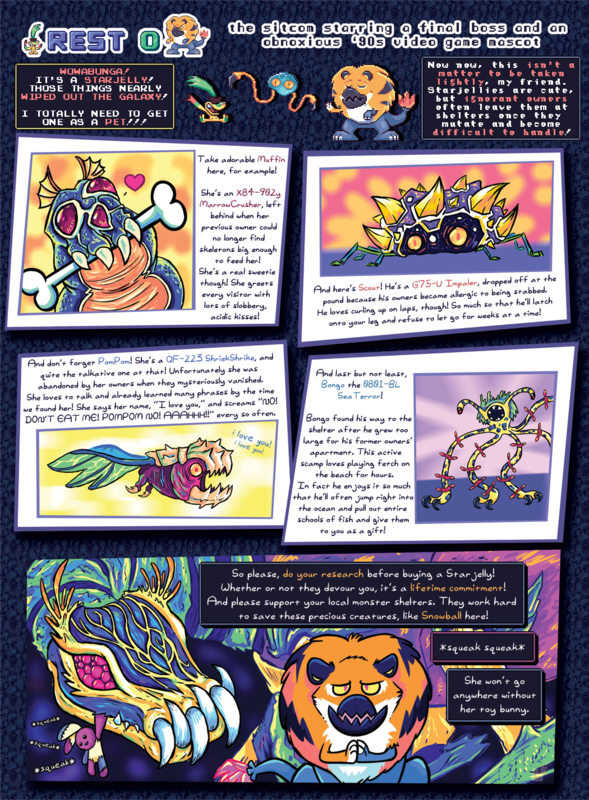 This issue was themed around Metroid, so this particular page parodies the different stages of Metroid evolution. Just a Flash demo reel, featuring my favorite thing ever... ADORABLE MONSTERS! 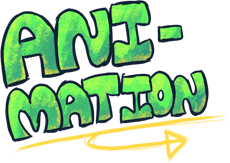 Something I made in Flash, just to see if I could. It started off as just the eyeball, but I kept adding more and more to it until it turned into this pseudo-dinosaur-thing. Art for the pre-show for Awesome Games Done Quick 2019. The countdown to the start of the event features pixel art of the interview team, inspired by the stage select screens in the Mega Man series. During the planning stage for the opening skit, one of the interviewers jokingly suggested creating fake establishing shots for the event hotels, making them look like Dr. Wily's fortress. I loved the idea, so I animated two Wily-esque castles over the course of a few days. The countdown timer and stage select screen were programmed by Support Class. A test animation for the "Maw Maw Bear," an enemy for the game "Luna's Tale" by Maestro Interactive. A promo video I did for TSG.tv's week-long Pokémon marathon, raising money for ACT Today. My friends voiced all the characters. My goal was to make a cartoon that was entertaining, even to people who never played the games. Regardless, that didn't stop me from putting in a ton of nerdy references in the background. The music is by Dasgust. Another promo video I did for TSG.tv's second week-long Pokémon marathon, this time to raise money for St. Jude Children's Research Hospital. Pokémon X and Y had just recently been released, so I figured to animation some of the new Pokémon from those games. Thanks to everyone who provided voices! TSG Final Fantasy '13 Marathon Credits! The opening credits for The Speed Gamers' Final Fantasy 2013 marathon. They raised over $30,000 for ACT Today! Another promo video for The Speed Gamers. This was made for their Pokémon "Gotta Catch 'Em All Retrothon," where they played the first two generations of Pokémon games in an effort to catch the first 251 creatures. The song is from a CD that was produced when Pokémon first hit America, and the video features at least one Pokémon from every evolutionary line in the first generation of games. It's pretty cute, don't you think? Also, I don't think I've said "Pokémon" in this description enough times, so here are a few more: Pokémon, Pokémon, Pokémon. A "VG Flash" cartoon, starring Wilhelm the shrimp and Zee the blueberry. VG Flash cartoons are just shorts I made to promote The Speed Gamers' various charity marathons. They always star these two characters and are set to video game music. This particular short throws them into the middle of a huge clock, set to "Clockwork" from Castlevania Judgment. You can find all my VG Flash cartoons here. A VG Flash created for Obligatory Ice Level Day, a month-long event leading up to The Speed Gamers' December charity marathon. As you may have noticed by now, the characters sometimes change styles from short to short. This time I tried for a more traditional Flash design. In this cartoon, Wilhelm and Zee have fun snowboarding around. Some people have asked if I used any 3-D in one scene (you'll know it when you see it,) but it's 100% Flash. The song is "DK Summit" from Mario Kart Wii. A VG Flash? Again? SURE WHY NOT. This is one of the oldest in the series, but it's still one of my favorites. Wilhelm the shrimp and Zee the blueberry prove that cute characters have everything to do with horror game themes. The song is "The Penitent," from Eternal Darkness. Another VG Flash cartoon, this time for The Speed Gamers' Mother/Earthbound marathon. Wilhelm the shrimp and Zee the blueberry hold auditions for their roles in a future cartoon, with goofy results. The music is "Humoresque of a Little Dog," from Super Smash Brothers Brawl. A silly cartoon showcasing the madness that is the Final Fantasy series. This is mainly here because I can only assume you came to this site just to learn about absurdly long RPG games. Music was provided by Another Soundscape and Ravepulse.